Makebe-leaves UV exterior artificial plants and tree products use innovative technology, and include lush artistic designs that provide warmth and ambience – complimenting a space without being conspicuous. The real magic in incorporating the use of faux Plantscapes is the freedom you get in a large range of options. They don’t have to grow in your area, be watered, require a source of light; won’t be eaten by bugs and they will look healthy all year-long! Wow, hard to beat. Enjoy your planning and be sure to call if you’d like my recommendations or options. We know what works and we will go out on a limb to make your idea come to life. As with any of our plantscaping projects, the goal is to create pieces that looks so natural – people won’t be able to tell it’s not real, live plants. Our UV exterior flowering foliage “fills in” the gaps to create beautiful, colorful trellis & lattice plantings enjoyed year round. 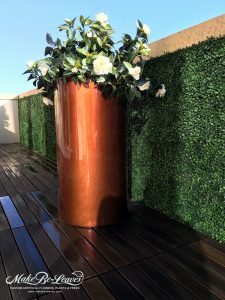 The UV flowering plantings blend beautifully with the existing live plants, so during the peak season of the year the live flowering plantings naturally blend with our artificial foliage. Here are some customer examples. Make Be-Leaves recently worked with Dan Vandenbark of Dezine, Inc. on a large penthouse balcony. Dan incorporated a mix of live tall trellis plantings to create privacy, with added UV red bougainvillea to bring a punch of strong color, a custom UV exterior boxwood wall attached to the balcony retaining wall, and potting of UV outdoor white gardenias into tall fiberglass planters. The overall effect creates a warm, inviting environment with a spark of color – which the client will enjoy year-round! From the entrance of the famed Sunset Marquis Hotel, you have no idea how expansive the grounds are, with lush plantscaping that meander through the property – including a wonderful, intimate outdoor wedding gazebo. 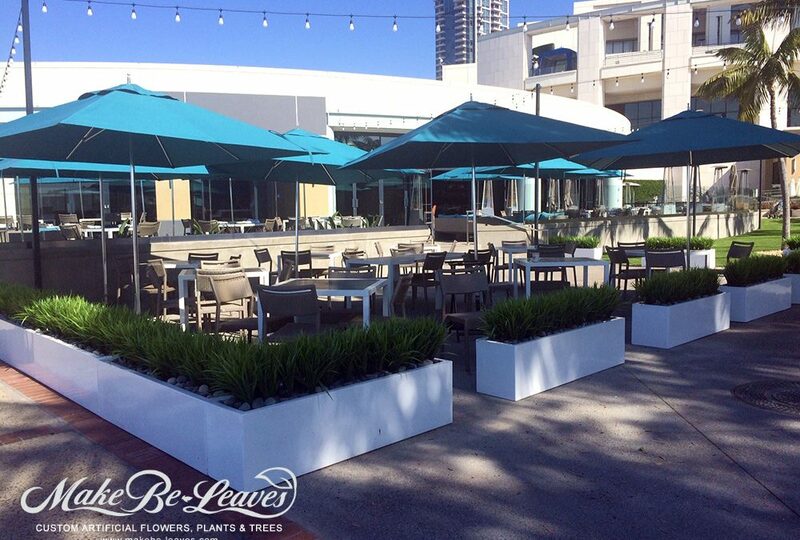 General manager, Rod Gruendyke, contacted Make Be-Leaves to “dress” the gazebo with permanent artificial flowers. Using a combination of UV exterior white bougainvillea long trailing garlands and natural grapevining wood, the gazebo was transformed into an enchanting, magical space. Mr. Gruendyke incorporated beautiful live, plantscaping to surround the outer perimeter of the gazebo – this combination of UV artificial and live plantings created the perfect venue for intimate weddings. Our UV exterior faux grass plantings, recently installed into 17 rectangle planters and 5 large round planters, brought a fresh, green accent to the space, and created a framed privacy area for the outdoor area of Sally’s On The Water Restaurant restaurant. In addition to our UV exterior artificial grasses, the hotel incorporated large planters with live mixed succulents – a beautiful mix of real and artificial! Call me to discuss how Make Be-Leaves artificial plantings can add value to your interior and exterior design projects.